Former Minister of Aviation, Femi Fani-Kayode, has reacted to the appointment of his former wife Saratu Atta by the president-elect of Ghana. Nana Akufo-Addo appointed Saratu Atta on Wednesday as a personal assistant to serve in his government which will be inaugurated on Saturday. “I am very happy for her,” Mr. Fani-Kayode told PREMIUM TIMES on telephone Thursday afternoon. “She certainly deserves it because she’s been working with Akufo-Addo for so long and I am sure she will do a great job. The Ghanaian president-elect, a member of the New Patriotic Party, emerged winner of the December 7, 2016 elections there, defeating incumbent John Mahama of the National Democratic Congress. Ms. Atta, 53, married Mr. Fani-Kayode in 1987 and bore him a female child named Folake in the same year. They parted ways around 1989 when Mr. Fani-Kayode found a new wife, Yemisi Wada. She is the daughter of the first civilian governor of Kwara State, Adamu Atta, who passed on in May 2014 at the age of 87. 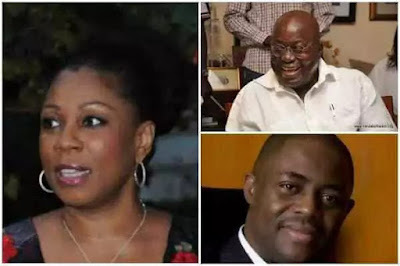 PREMIUM TIMES’ findings also reveal that Mr. Akufo-Addo was once married to Mr. Fani-Kayode’s older sister, Remi. The Ghanaian president-elect and Remi were married for 10 years and spent most of their time together in Paris before returning to Accra where they later divorced after two children together.